You know I love my bright handbags, and I have quite a few colourful Rebecca Minkoff bags. Making the most of the lovely summer weather here in Brisbane at the start of January, I headed to some different parks with the boys, and accessorised the plain shorts and tee outfits with some fun bags. This is one of those outfits that looks nice in the photos but really wasn't good to wear. I'd planned it the night before, while in the aircon, and decided that this plain black tee would look so good with the printed black shorts. They do look nice together, and the pink accessories were such a fun touch with all of the black - the hot pink mini MAC bag really pops against the neutral outfit. However monochrome black was not such a good choice for a hot summer day on one of the local walking trails! Especially as I forgot my water bottle. If I'd been inside for more of the day, or wore this on a cooler day or on a shadier trail, I would have liked it more than I did. Last worn: black printed shorts, Havaianas, Rebecca Minkoff neon mini MAC. First time I've worn the tee as I recently got it from my sister's wardrobe, and the necklace was a Christmas present. Other ways to wear: black printed shorts and kimono, Rebecca Minkoff neon mini MAC and printed dresses. This outfit was much better suited for a day out in the sun! The tee is another new-to-me one from my sister's wardrobe. It's not the first time I've won these olive embroidered shorts with stripes, I really like the combo so when I got this navy stripe tee I knew I wanted to try it with the shorts right away. The mustard micro Regan bag is another frequently worn option with the olive shorts too, I really like mustard and olive together. Even with the mustard bag and olive shorts, I added another colour with the necklace and bracelets - I picked some of my new rose gold accessories. I have this Kmart necklace in navy and gold and I am thrilled to have the pink and gold version now too! I thought it matched matched my pink, rose gold and pearl bracelet stack well, especially with the addition of the rose gold sandals. The shiny accessories were a bit more dressed up than a playdate at the park called for, but it was a cute touch of sparkle for the final day of the year. Last worn: olive embroidered shorts, rose gold sandals, Rebecca Minkoff micro Regan bag. First time I've worn the necklace and bracelet stack as they are recent gifts, and the tee is from my sister's wardrobe. Other ways to wear: olive embroidered shorts and grey knits, rose gold sandals and maxi dress, Rebecca Minkoff micro Regan bag and skinny jeans. Shorts and a tee is a staple summer outfit. On hot days, soft lightweight shorts like these are a good option for dealing with the heat. A practical outfit for running around a playground with the kids too! Maybe just don't pair a black tee with them if you're out in the sun! Linking up with Fabulous Friday, Weekend Wear. I love the printed black shorts, they're right up my alley! And to be honest, I'm not a big fan of yellows and mustards, but that bag does look pretty cute. Great post! I love bright bags too. Your collection of bright bags is so lovely, and they are always a great pop of colour with your outfits. The first outfit is lovely, but I can see how the black monochrome look might not have been the best option on a hot sunny day. It is a nice combo nevertheless, and I like how the bag stands out against the black. The second outfit is beautiful as well. Those neutral colours go so well together. I love olive green. Shorts and tees are a great outfit formula for summer. You look great in both looks, very fresh and pretty. I love bright colored bags too and these ones my dear are beautiful. Oh my goodness Mica, is that a Shih Tzu I see in the pics? We have one, her name is Sophie. I really admire the Minkoff bags and came super close to getting one in December. I really like the bright pink one - you know I love me some pink! 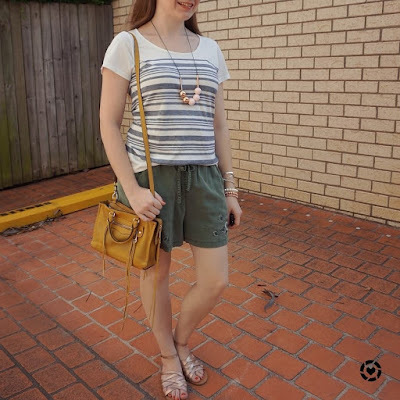 I have a similar pair of black and olive shorts and now I really can't wait to wear them! Love the color pop on these outfits with the handbags! i love your pop of colors with the purses. You know I read once that you black isn't as hot to wear in the sun, but I don't believe them. It seems so much hotter!!! It definitely felt much hotter in the sun, I was seeking out shade as much as possible! A shorts and tee is definitely a classic combination. It's too bad you ended up not enjoying the first outfit because of the weather. It still looked great though and I especially like the accessories in your second look. Your bright pink bag is so cute! Love both of these looks and jealous of your summer weather! Soft shorts are a go-to of mine in the summer- they're just so easy to wear when it's hot! They are great options for warm weather! Yes, I bet that all black was attracting the heat. The Micro Regan bag is beautiful and I love the colour of the bag itself. It looks lovely with the olive shorts. Very cute outfits. You're right black for an Australian summer must get very hot! My friend lives in Arizona and swears by a sun umbrella!! You should try it! I love the pop of color with the pink bag! It is such a cute look! Love the hot pink bag with black. Those rose gold sandals are stunning, perfect for the weather these days. Yes, I tried to avoid wearing black clothes on hot day but there are just times we think it really looks cute just like what I wore on Monday though we stayed in the cafe most of the time. Your Minkoff bags are the cutest, I like both colours. It's almost weekend, have fun! You have such a fabulous handbag collection, I love the way you add color with it! My favorite is with the pink bag against the black outfit. I really like the looser fit of both of these shorts. They look like they would be much cooler during those hot days! I have made the mistake with the black tee once - it really gets so hot! It was so hot! Especially forgetting my water at home! You look so cute and summery! Love your handbag collection! Nice bags dear! The yellow one is great! I am freezing in Chicago right now so I would love to wear either of these looks. Love those olive shorts with the embroidery. Love, love your hot pink bag! That would have been perfect with my outfit of last week! And I think I'm going to need some rose gold sandals in my closet! :) Have a great weekend Mica! I like your second look, you know I don't really like a black monochrome outfit I'm not a fan of that color. I think the second look is cooler and for a sunny day. Such cute outfits and so jealous of your shorts. It's so cold here in Chicago. I love wearing bright colored bags during the summer, too. They really add the perfect seasonal element to an outfit and also allow for you to go simple with the rest of your outfit, if you so choose. I love the two you've styled here, especially that pink RM one. I spotted it years ago at TjMaxx and wrestled with whether or not I should buy it and didn't. I wish I would've because it's so fun! Thanks for the inspo and I hope you're having a great week! It is such a fun bag - hope you stumble across it again! I picked this up on ebay super cheap! Even though the first outfit wasn't the best for the heat, I really love how it looks! The pink purse is a great pop of color. And you always wear the perfect purse for each outfit. I hope you stay cool and enjoy the rest of your week! I love both of your soft shorts looks! Those are great shorts and I couldn't pick a favorite if I had to. Maybe a black tank with the first one would have been a bit cooler. I know you guys are having quite a heat wave there right now. Both bags are fabulous pops of color but I'm so into the mustard color right now that the second would definitely be my favorite! I do love your second outfit - perfectly summery and the rose gold touches are lovely! I find that I'm steering away from all black ensembles... I still love black, but not too much, IYKWIM. The pop of colour from the bag is a great way to break up the monochrome! Ooh I love that rose gold and pink necklace, it's so pretty! Sometimes you need a bit of sparkle :) I also love how the bright bags pop in both outfits--those are both such fun colors! I love how popping your Rebecca Minkoff bag looks! I am jealous that it's shorts weather out there. It's still cold in LA to rock them, hehe. I like how you paired the gold bag with olive shorts. They go well together! Your bright bags are obviously super cute, but I also love the fun necklaces you're wearing here! That neon RM bag is a beauty and neon is so on trend right now.